To make candied grapefruit peels, you'll need two large grapefruits to start. Cut the grapefruits into 4 wedges. Then remove the peel from each wedge. You'll have 8 grapefruit peels. Cut them into chunks or long strands. Place them over a stove top in a boiling pot with about 1 inch of water covering them. When the water starts to boil, remove the pot from the heat, strain the grapefruit peels and then place them back into the pot with fresh water and boil again. Repeat this step 4 times. This is because grapefruit peels are very bitter and you want to get rid of the bitter water as soon as possible. After you've boiled them in fresh water for the 4th time. Strain and set aside. In the pot, add in 4 cups water and 4 cups sugar. 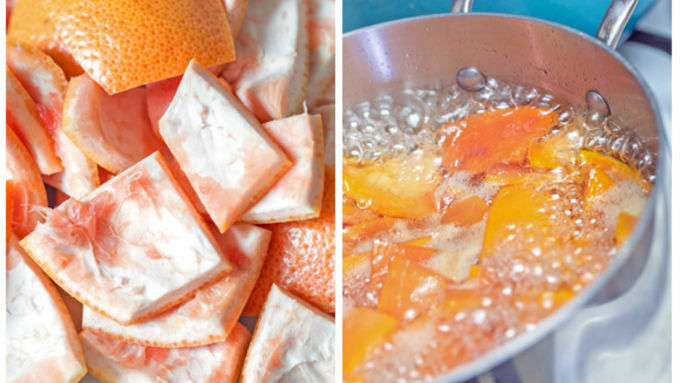 Stir until sugar and water are combined, then add the grapefruit peels back in.Boil the mixture over high heat for about 30 minutes, stirring occasionally until there are large opaque bubbles and the grapefruit zest is completely translucent. Strain the mixture over a heat proof bowl so you can keep the simple syrup for a cocktail if you want! 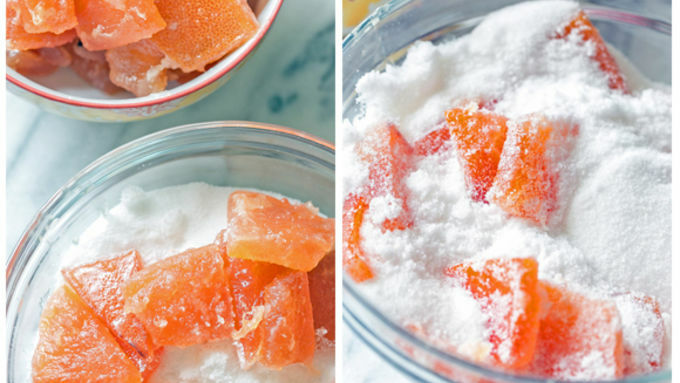 Place 1 cup sugar in a bowl and add in the hot grapefruit peels. Mix them in the sugar so they're completely covered. Then set on a plate to cool. In a cocktail shaker, add ice, grapefruit juice, agave and gin. Shake several times. Pour over a 4oz glass filled with ice. To garnish, slide two candied grapefruit peels onto a wooden skewer (cut in half) and place on the rim of the glass. 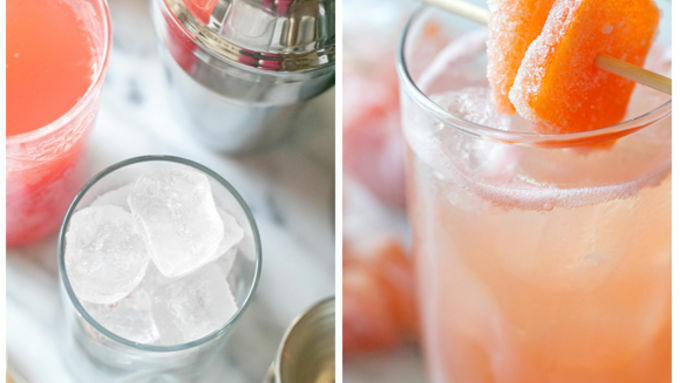 This is actually one of my favorite cocktails because of the easiness, freshness and delicious grapefruit flavor. 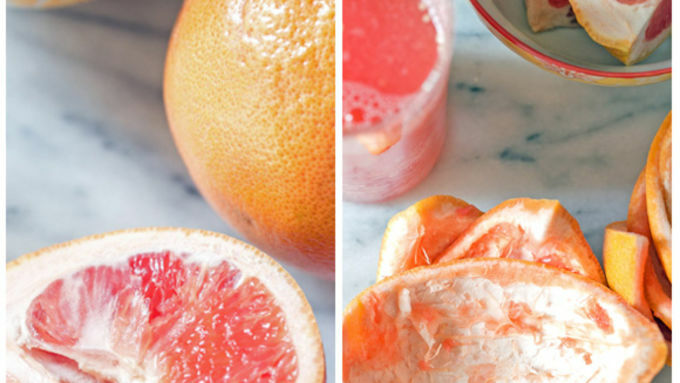 It reminds me of a hot summer day in Los Angeles, where you can pick the freshest grapefruits right from the tree and then juice them to make one delicious, nutrient-packed cocktail! To top it off, I made homemade candied grapefruit peels, which turned out excellent! 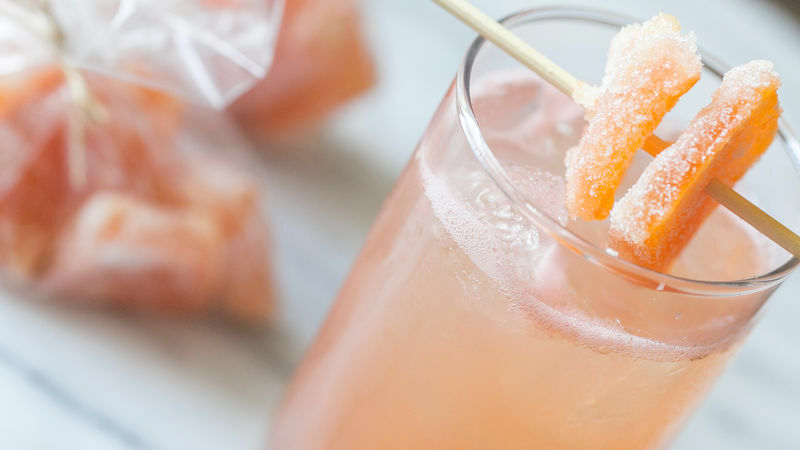 Such a charming way to garnish this Candied Grapefruit Cocktail. And they make wonderful party favors when put in cellophane bags and tied with some twine. Enjoy!